All the talk this week, and rightfully so, has been about the impending collision between the two teams this site, and many others, rank numbers one and two in the country. But there are a number of other things to keep an eye on this weekend as well, like how teams who picked up big week one wins - Notre Dame, Arizona, and Tennessee, for example - will respond in week two. 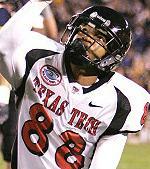 In addition, there are also a number of big showdowns out west, like the matchup between in-state rivals Texas Tech and UTEP. Also watch out for a select few important early-season conference showdowns. What more can you say? College football fans have been looking forward to this matchup for months (actually, since round one went to UT back about this time a year ago), and just as many expected, it will match the top two ranked teams in the country. The winner gets a huge leg up in the national title chase, while the loser will be scrambling from behind throughout a tough conference schedule the rest of the year. It's primetime, it's numbers one and two, it's Ohio State and Texas. Need we say more? A number of teams picked up impressive wins over the opening weekend, but a select few of them bounce back in week two with difficult matchups that could trip them up if they're still on a high from the big victory last week. Rutgers outlasted North Carolina on the road and should handle Illinois with ease if the Knights are on their game. Mississippi looked good in a home victory over Memphis, but how will the Rebels respond on the road at Missouri? Notre Dame got by Georgia Tech, though it wasn't all that impressive. The Irish must be on top of their game this weekend if they're to top Penn State. Arizona got their season off to a great start with a home win against BYU, but next up is a road trip to LSU. Ouch! Tennessee, meanwhile, ran all over Cal but must battle a pesky Air Force squad in week two. Finally, South Carolina won on the road at Mississippi State to get the season started last Thursday, but Georgia's version of the Bulldogs will be a much tougher test to pass. The Thursday night showdown between Oregon State and Boise State was just a primer for the weekend out west headed our way. Among the great matchups set to take place this weekend is the encounter between Idaho and Washington State. The Vandals and first-year head coach Dennis Erickson put a scare into Michigan State last week and could very well do the same this week to a Cougar squad coming off a thrashing at Auburn. Tulsa and BYU will meet in an important non-BCS non-conference matchup, while in-state rivals Colorado and Colorado State also go head-to-head on Saturday. Both the Cougars and Buffaloes are coming off losses a week ago. Elsewhere, Nevada will look to pull an upset at Arizona State, while Fresno State will look to do the same at home against Oregon. And last but most certainly not least, it might be worth pointing out that the most exciting game in the country this weekend is in Texas. Duh, you already knew that. But not in Austin; try El Paso. Texas Tech and UTEP will get together Saturday evening about the same time Texas and Ohio State are doing battle, and with the way those two squads throw the football, these two west Texas rivals could provide the most entertaining contest of the entire weekend. First one to 50 wins...maybe. It's still very early in the season, but there are a few big conference battles over the coming weekend. The most important appears to be in the ACC where Clemson travels to Boston College. Both teams are expected to finish near the top of the conference, and this game will give one of the two a leg up in the race early on. Elsewhere in the SEC, Georgia and South Carolina will meet in Columbia. The Bulldogs dismissed Western Kentucky with relative ease, while USC took down Mississippi State on the road last week. Both teams have SEC East title aspirations, but with Florida and Tennessee waiting down the line for each, this early-September game is crucial. And finally in the MAC, neither is as big as the two mentioned above, but a pair of games between Ohio and Northern Illinois, and Toledo and Western Michigan will be worth keeping an eye on. Minnesota over California - OK, maybe this isn't that huge, but with the expectations Cal had coming into the season, an 0-2 start would be dissasterous. However, the Gopher offense is very efficient, and the Bears appeared hopeless in attempting to stop Tennessee last Saturday. There are likely to be some big points on the board in Berkeley this weekend, something Minnesota - who led the Big Ten in scoring last fall with more than 35 points per game - won't be upset about.